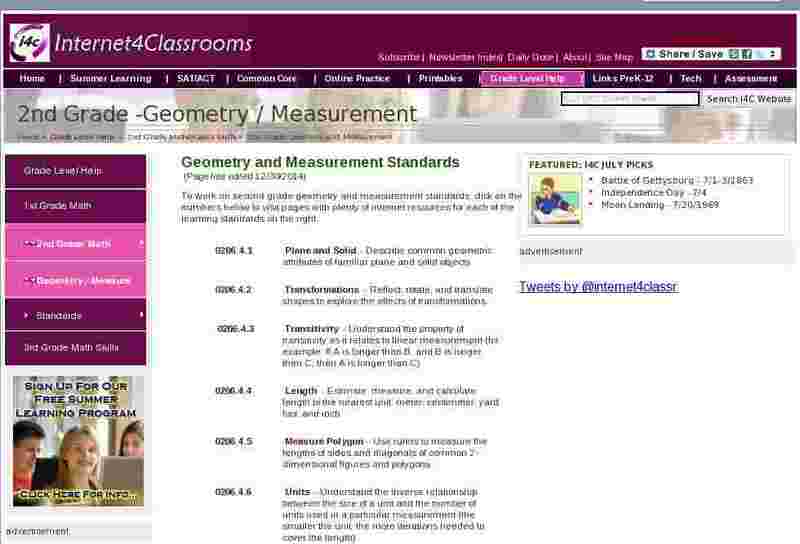 To work on second grade geometry and measurement standards, click on the numbers below to visit pages with plenty of internet resources for each of the learning standards on the right. Plane and Solid - Describe common geometric attributes of familiar plane and solid objects. Transformations - Reflect, rotate, and translate shapes to explore the effects of transformations. Length - Estimate, measure, and calculate length to the nearest unit: meter, centimeter, yard, foot, and inch. Measure Polygon - Use rulers to measure the lengths of sides and diagonals of common 2-dimensional figures and polygons. Units - Understand the inverse relationship between the size of a unit and the number of units used in a particular measurement (the smaller the unit, the more iterations needed to cover the length). Compose Polygon - Investigate and describe composition, decomposition, and transformations of polygons. Combine Polygon - Combine polygons to form other polygons and subdivide a polygon into other polygons. Recognize Polygons - Recognize the composition and decomposition of polygons.